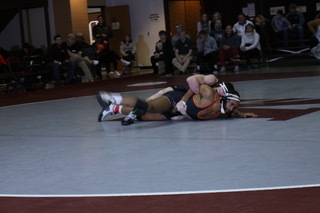 By Grace Nordquist–The Morningside Men’s Wrestling team competed against the University of Jamestown Thursday, Jan. 31, in what would be their last home dual for the season. For the class of 2019, it would be the last time competing in their home field house. It was a special night for the Senior class, and they left their mark with a 47-4 win over Jamestown. 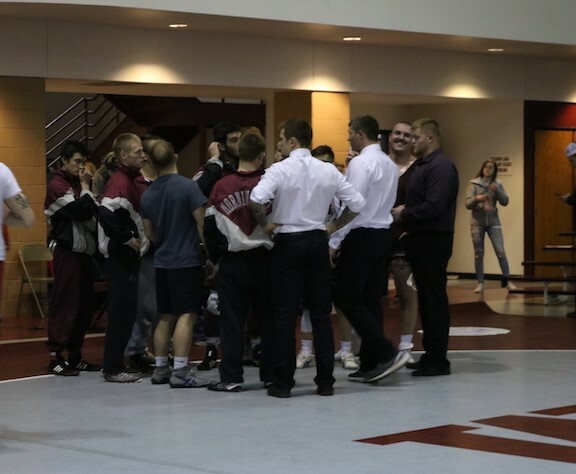 Meet the Morningside wrestlers who have put their blood, sweat, and tears into the intense sport of wrestling. The countless years of waking up early, grinding in the weight and wrestling rooms, and cutting the weight will soon be memories for the 2019 graduating class. Among those memories are some from their past years spent at Morningside. Lane Nichols from Hornick, IA wrestles at 141. Nichols is an Applied Agriculture and Food Studies Major. Nichols can’t recall a favorite Mustang memory but says he will not miss cutting weight. Keagan Putnam from Sergeant Bluff, IA wrestles 165. Putnam is an Elementary Education major. His favorite memory as a Mustang is similar to his teammates, describing the bond he created with them and the coaches. Putnam comments on the group of seniors and how goal driven and supportive they are of one another, “We can count on each other.” Putnam, looking back says, “Everyone pushes each other on the team and I have felt myself grow so much in this sport from my freshman year to now. 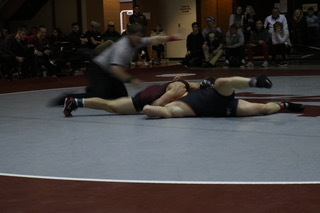 I love the competition that Morningside has brought me.” Looking forward, Putnam hopes his favorite memory is yet to come by achieving his goal of qualifying for nationals and becoming an All-American. The Mustangs continue to prepare for the GPAC tournament Feb. 16th with the goal of qualifying for the National Tournament in March, where these seniors will make their final debut.